Have you ever made Skillet Date Ball Cookies? O.k. . . . some of you are already turning your nose up. I might be UGLY . . . but I’ll be the best tasting spider you’ve ever sunk your teeth into. My son in law – hates Dates. Since “Spook Day” is just around the corner, I made them Creepy. 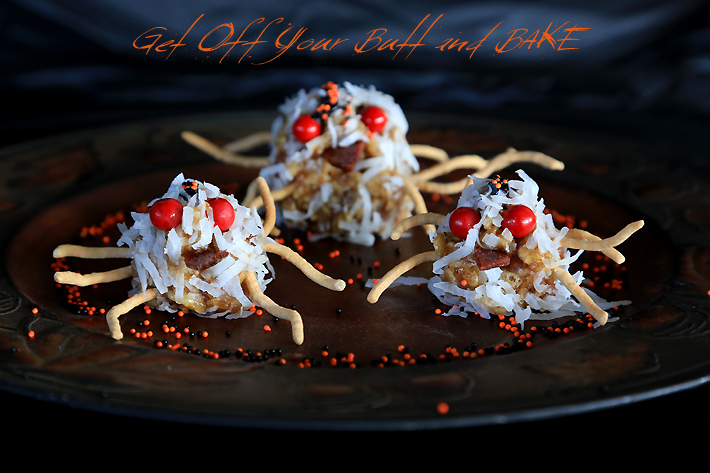 The Date Ball cookie is the center of the Spider. 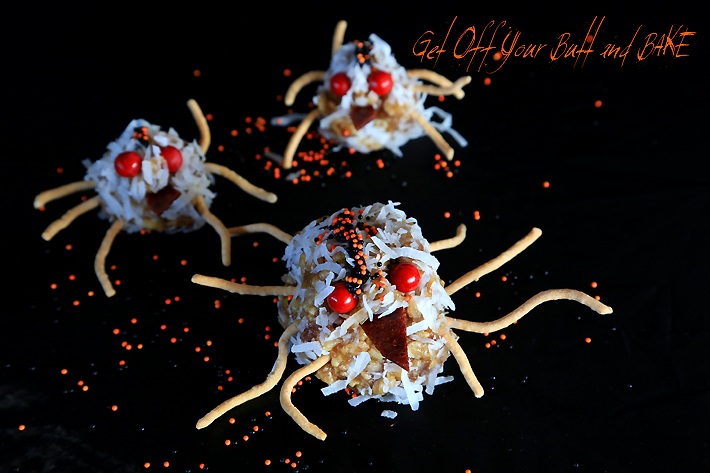 Sixlets become eyes & chow mein noodles are transformed into legs. Black gel and sprinkles give the spider it’s stripe. Fruit leather is the spiked tongue. Pretty simple, pretty ugly, Really good! 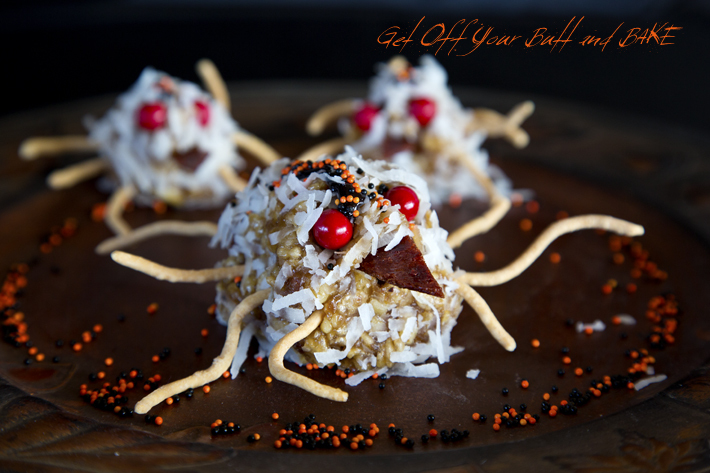 Ring your neighbors door bell, and leave them a plate of spiders! This is one of our favorite Christmas Cookies . . . minus the legs, tongue & eyes. WE HAVE OUR WINNER FOR THE COOKBOOK GIVEAWAY. Sheila . . . I have your email address, and will send you quick note. Once you receive my email, come back here and leave us all a comment please. I will need your mailing address as well. In large skillet on top of stove, melt one square of butter (1 stick), and 1 cup sugar. Melt and stir together overlow heat. In a medium size bowl, whip your 3 eggs – with a fork until frothy. Stir quickly into butter mixture thoroughly, stirring constantly. Now add 1 cup chopped dates and 1 cup chopped nuts. Keep stirring and simmer this mixture gently for at least 15 to 20 minutes. Don’t stop stirring….very important. The mixture will deepen in color as it simmers on the stove and will thicken to a thick jam like consistency. Remove from heat, and let cool for about 10 minutes. Add rice crispies and vanilla and stir together.